WASHINGTON — Bethesda, Maryland-based aerospace technology company Lockheed Martin has officially begun production of its experimental jet capable of flying at supersonic speeds without creating loud supersonic booms. 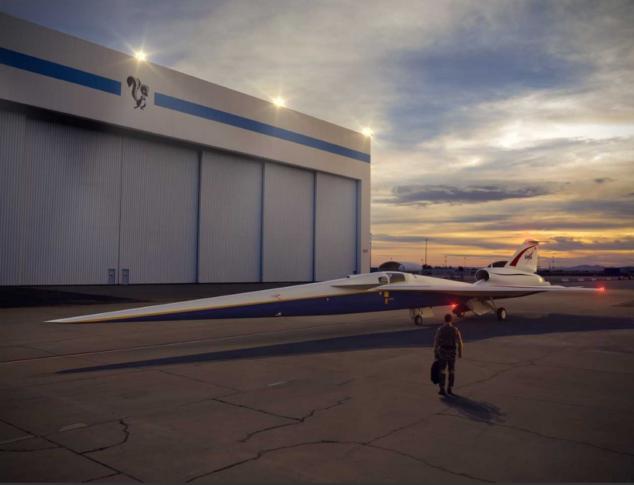 The X-59 Quiet Supersonic Technology aircraft addresses the current ban of commercial supersonic aircraft from flying over land. “The long, slender design of the aircraft is the key to achieving a low sonic boom,” said Peter Iosifidis, Low Boom Flight Demonstrator program manager at Lockheed Martin. “As we enter into the manufacturing phase, the aircraft structure begins to take shape, bringing us one step closer to enabling supersonic travel for passengers around the world,” he said. NASA awarded Lockheed a contract this year to design, build and flight test the plane. Lockheed expects to conduct its first flight in 2021 and gather community response data on the acceptability of the “quiet sonic boom” the plane creates. NASA will use that information to establish an acceptable commercial supersonic noise standard to overturn current regulations banning supersonic travel over land. The X-59 will cruise at a speed of about 940 mph and an altitude of 55,000 feet. Lockheed says it will create a sound about as loud as a car door closing, instead of a deafening sonic boom. Lockheed Martin Skunk Works, previously known as Lockheed Advanced Development Projects, has developed aircraft previously, including the U-2 and SR-71.